Touch the Search button on the keyboard, and that location is then shown on the map. The next step is getting directions. You don’t need to type the entire address. Oftentimes, all you need is the street number and street name and then either the city name or zip code. If you omit the city name or zip code, the Galaxy Tab looks for the closest matching address near your current location. This command flags movie theaters on the current Maps screen or nearby. Specify your current location to find locations near you. 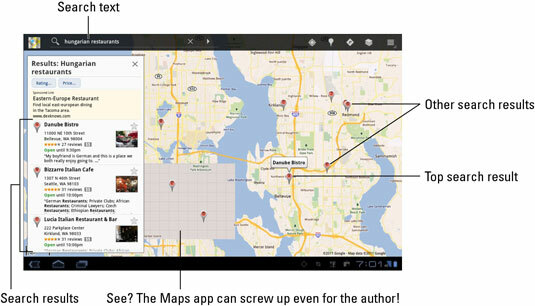 Otherwise, the Maps app looks for places near the area you see on the screen. After typing this command and touching the Search button, you see a smattering of Hungarian restaurants found near Seattle. To see more information about a result, touch its cartoon bubble. The screen that appears offers more information, plus perhaps even a web address and Tab number. You can touch the Get Directions button on the restaurant’s (or any location’s) details screen to get directions. Every letter or dot on the screen represents a search result. Spread your fingers on the touchscreen to zoom in to the map. You can create a contact for the location, keeping it as a part of your Contacts list: After touching the location balloon, touch the More button and choose the command Add As a Contact. The contact is created using data known about the business, including its location and Tab number and even a web page address — if that information is available. Maybe you don’t know what you’re looking for. The Maps app features a sort of I-don’t-know-what-I-want-but-I-want-something fairy. It’s the Places command. Touch the Places button to see the Places pop-up window. It shows categories of places near you: restaurants, coffee shops, bars, hotels, attractions, and more. Touch an item to see matching locations in your vicinity. You can also use the Places app to summon the Places pop-up window in the Maps app. You can find the Places app on the Apps Menu. You can hone in on where your contacts are located by using the Maps app. This trick works when you’ve specified an address for the contact — home, work, prison, or another location. If so, the Galaxy Tab can easily help you find that location or even give you directions. The secret to finding a contact’s location is the little Place icon by the contact’s address, shown in the margin. Anytime you see this icon, you can touch it to view that location by using the Maps app.